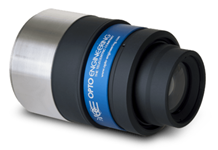 This lens has a standard mount for compatibility with many linescan cameras. The same lens with a M72 mount is readily available; additional mounts are available on request. This lens has a near and far focusing range. At the near range, the magnification is 0.100 at a working distance of 924.1 mm. At the far range, 0.067 at 1370.9 mm. The f-number shown above is the “working” or “real” f-number of the lens when used as a macro. Please contact us if you need a lens having a different aperture.